Hi everyone! 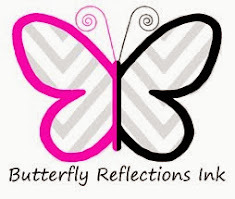 Lindsay here for the Butterfly Reflections, Ink blog post today. I'm still obsessed with then new Avery Elle release so I've made another card using their products today. I first cut out an A2 size stitched rectangle panel using Lawn Fawn Large Stitched Rectangle Dies. Then I used the Avery Elle Circle Frame Elle-ments Die to cut out the evenly spaced circle frames onto the panel. 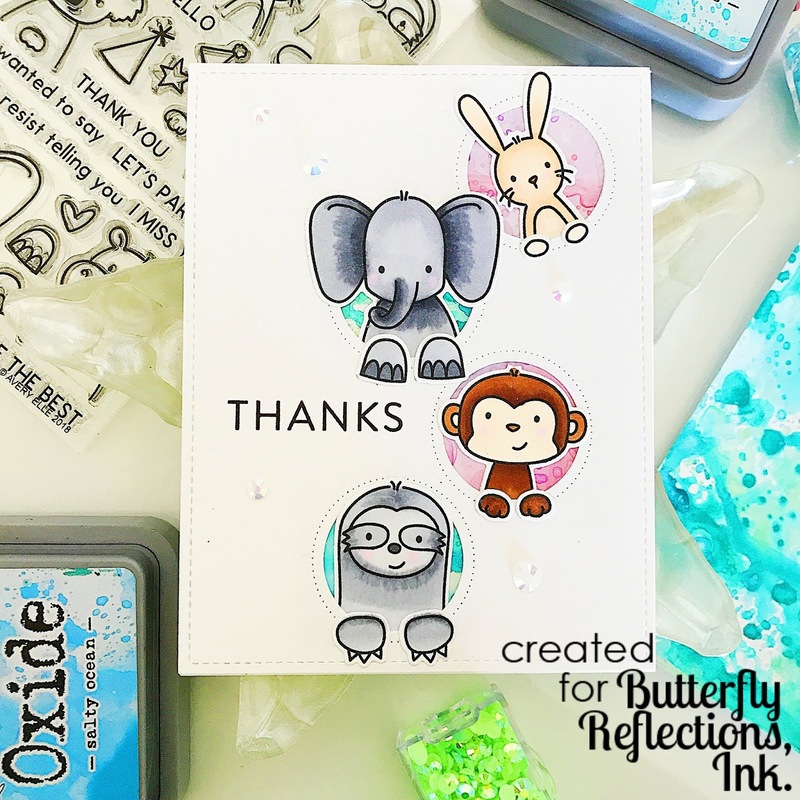 I'm really loving this new die from Avery Elle as I struggle with layout sometimes and this does all the work for you and you get perfectly spaced circle frames every time! This would be great for any sort of mass production of cards. I had some Distress Oxide Ink backgrounds from previously playing around with them and the Distress Micro Glaze, so I used the pinkish and bluish backgrounds and cut tiny squares out of the backgrounds just large enough to cover the space left by the Circle Frame Dies. I then adhered those to the back of the panel using a tape runner. 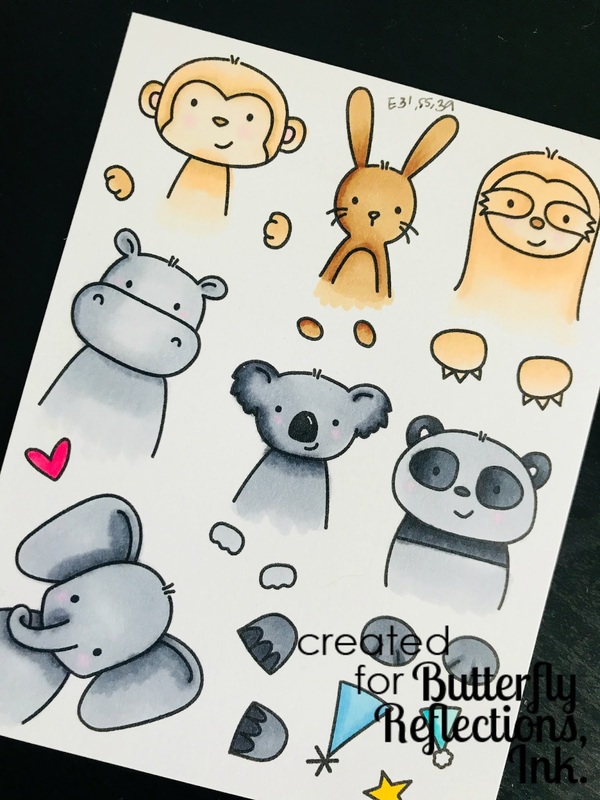 I then got to working on my critters! 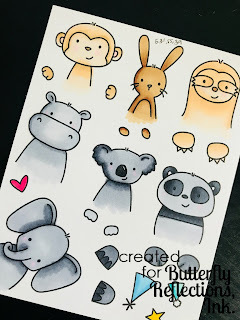 I stamped a bunch of the images from the Peek-A-Boo Pals Stamp Set using Extreme Black Hybrid Ink Pad for copic coloring. I colored the images using Copic Markers in a variety of brown, tan, and gray shades. Copic coloring is a pretty new venture for me so I'm still practicing! I colored more images than I would need for this card just to have some leftover for future cards. Then I got to die cutting using Peek-A-Boo Pals Elle-ments Coordinating Dies. 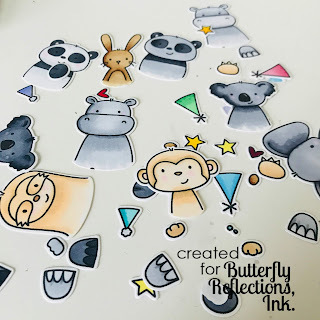 This took some time as there are die cuts for all the little feet, hooves, and paws as well, which is really nice for someone like me who hates fussy cutting! All that was left to do at this point was to arrange all the critters and their little feet into the Circle Cut Dies and stamp the sentiment. Thanks so much for stopping by today! Hope that everyone had a great Memorial Day weekend!